Alex and Lisa got married Tuesday – for the seventh time. 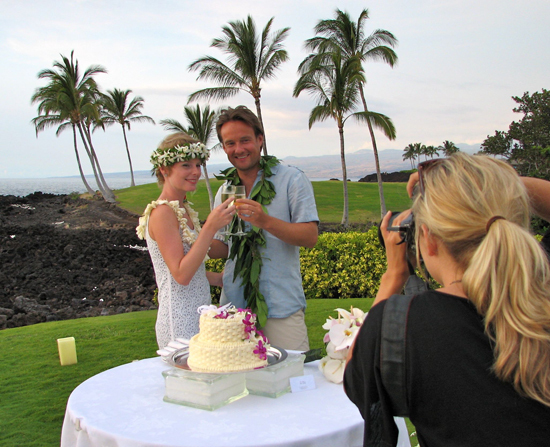 Tuesday’s ceremony, hosted by the Hilton Waikoloa Village, is one of 30 the couple has planned around the globe. Friends for 10 years and a couple for more than three years, Alex Pelling, 31, and Lisa Gant, 29, decided to leave their life in Manchester, England and explore the world. However, they also decided they needed a purpose to their globe-trotting. And once they decided to get married, the quest was set: Stage 30 wedding ceremonies, incorporating local customs, traditions and cultures. Alex gave up his car body repair shop and on June 6, 2011, the couple set off for Canada, but not before he surprised her with a practice wedding in England. Since then, the couple has married five more times along the U.S.-Canadian border and arrived in Hawaii about two weeks ago. “We have been to Oahu and Maui and the Big Island looking for the best place to hold a ceremony and we decided on the Big Island. We had the ceremony arranged and just hours before we were due to have the ceremony, it fell through. Devastated and out of time, we thought our hopes of a Hawaii wedding where over,” Alex said. 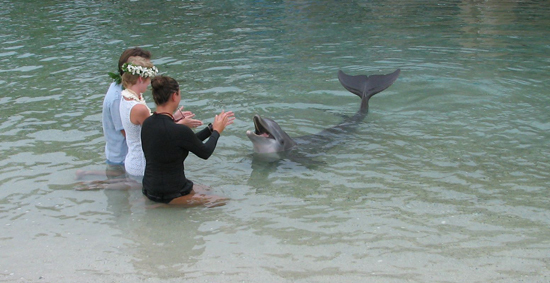 So, shortly after 4 p.m. Tuesday, people who gathered to watch the Dolphin Quest show found out they were wedding guests. Kahu Dean Kauka conducted the ceremony at the edge of the lagoon, with interested dolphins popping up in background and squeaking their approval. The hotel’s Hawaiian cultural coordinator Owana Wilcox helped organize the ceremony, offering a traditional Hawaiian chant to accompany Lisa down the aisle. Once the couple finds the perfect place, they plan to return and get legally wed once and for all. In addition to their families and friends from England, the couple will invite people they meet along the way. To begin with, their families were a little skeptical.